Hey look everybody – it’s Manji. What would you do if you could live forever? Once you get past the obvious things, really think about it. What would you actually do if you were immortal, and then, what if you had something you couldn’t live with? 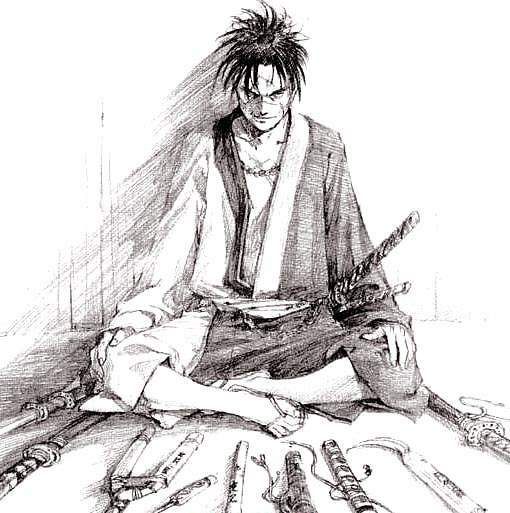 That was the initial premise of Hiroaki Samura’s Blade of the Immortal, a story about an immortal swordsman that has grown to include one of the most fully realized cast of characters in any medium, manga or otherwise. It would turn out over the course of 30 volumes that the answer to, “What would you do if you could live forever,” is to leave tragedy and bloodshed in your gloriously illustrated wake. Let’s back up for a minute, and talk about the characterization in this book. 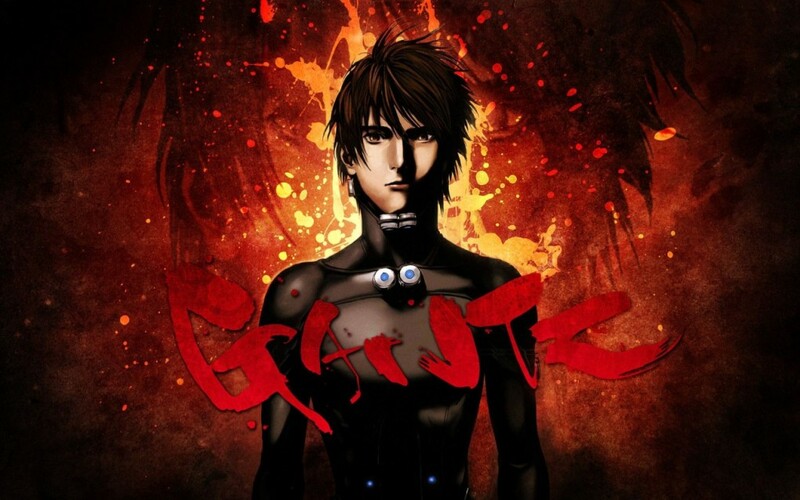 It follows the story of an immortal,masterless samurai named Manji, who was cursed with a mystical bloodworm that allows him to heal from almost any injury. Before he became immortal, Manji was responsible for killing 100 decent people for his former master, and to atone for his sins he promises that he will kill 1000 bad men to make amends. What’s interesting about Manji is that he is not what you would expect him to be. While the idea of the dishonored ronin brings to mind a dour character, like the rest of the cast Manji is instead crafted as multidimensional. Throughout the series he has moments of thoughtful introspection, but he’s also a loud mouthed jerk occasionally. Other times (like when he’s getting wrecked in a fight – for the umpteenth time) he’ll comment sarcastically about the horrific damage he’s sustained. In short he’s a multidimensional character who Samura refuses to shortcut into giving a single trait to, which is a rare thing to find in a lot of manga. Many manga creators would be content to create a character like Manji and then be done with it. Instead Samura was just getting started. Next is introduced a young girl named Asano Rin who is on a quest to take revenge on the master swordsmen of the Itto Ryu school of sword fighting because they are responsible for murdering her family. She draws Manji into her orbit since she needs a bodyguard. Along the way she discovers that violence only breeds more violence, and she tries throughout the series to come to terms with her own actions. While a lesser mangaka would make her the love interest of Manji, Samura is instead able to render their relationship as platonic, and almost sibling like. This works mostly due to the fact that Rin is complete as a character all by herself, and not on how she relates to other characters. Rin’s abilities (or lack thereof) in the face of exceptionally skilled warriors makes her the source of much of the drama. Her natural want is to take bloody revenge, but instead she finds that her inability to fight at the level of Manji or the Itto Ryu forces her instead to reconsider her motives altogether. It is the core relationship between Rin and Manji that ties the whole of the book together. Asano Rin represents a good person who desperately wants to be less good to avenge her family, and Manji represents someone capable of being exceptionally bad who wants nothing more than to put it all behind him. 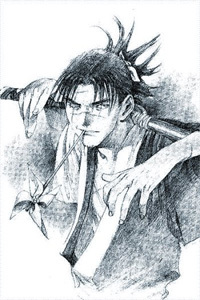 Yet Samura-san’s Blade of the Immortal is still not done creating characters that would be enough to drive their own book. Instead he creates the rogues’ gallery that is the Itto Ryu. Led by the ruthless yet principled Anotsu Kagehisa who is focused on the singular trait of the creating the ultimate sword school. His quest for perfection and the devastation his devotees leave in their wake could render him the protagonist if this was a different book. The longer the reader spends with him the more we begin to realize that his goal isn’t selfish. From a young age he learned that concepts of “honor” and “fighting fair” are born from a tradition (bushido in this case) that has no real place on the battlefield. Anotsu is trying, in his own way, to save the samurai tradition before the outside world destroys it utterly. Rin’s family was just a casualty in that bigger cause. Coincidentally, the people that gather around him are delightful in their own way. There’s Makie Otono-Tachibana, the most highly skilled fighter of anybody in the story, who is a geisha so she can avoid fighting unless it’s to protect who she loves. There’s Taito Magatsu, a peasant who fights because the upper classes that are protected by the samurai are corrupt. Not to mention members of the police force Mugai-Ryu, the background characters (like Rin’s painter/assassin uncle) or the other members of the Itto Ryu. Manji and his tools of hack and occasional slash. This extensive characterization has the effect of making the Itto Ryu very likeable. I mean as a reader you are never asked to forgive them, but they’re rarely ever portrayed as “evil.” Instead their morals are firmly in the gray but you begin to understand their motivations and how they see the world. It makes their inevitable confrontation with Manji – somebody who can’t die, into something tragic. As a reader you want somebody to realize the only way out is not through violence just so you don’t have to see people you have come to like get gruesomely dispatched. This blending of good and bad, and even what those mean relative to the characters is always in a state of flux. For example, while Manji is the core opponent of the Itto Ryu, his own methods of fighting are very much in line with how the Itto Ryu functions. He doesn’t fight fair, his weapons are weird and lethal and his immortality is basically cheating. In effect, he is the perfect ideal of what Anotsu is trying to achieve. The grand irony is that the actions of the Itto Ryu towards Rin are what led to Manji hunting them in the first place. If anything was different, or they’d just walked past Rin’s house then the story would turn out very differently indeed. 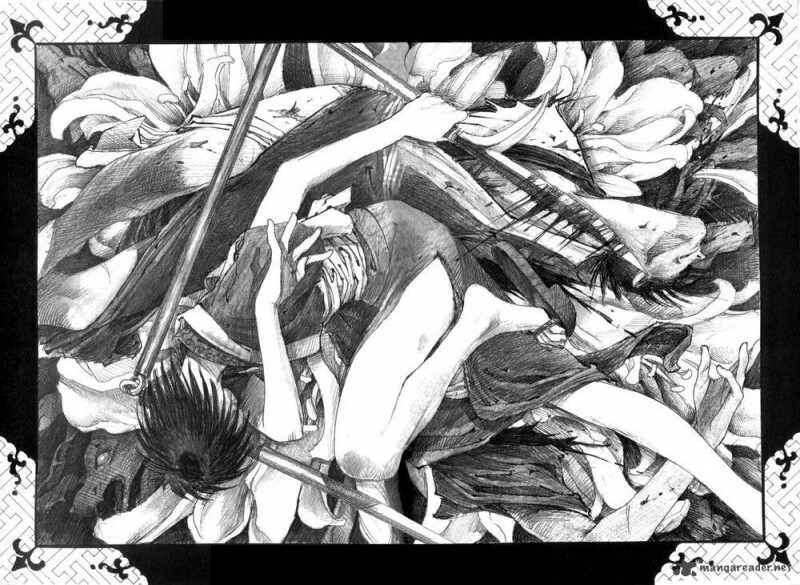 Throughout the first few chapters Samura fashions Blade of the Immortal into an episodic format. To sum it up, Manji and Rin encounter another members of the Itto Ryu, they figure out the best way to fight them and in doing so learn that they’re not really the monsters that Rin thought they were. Then, there’s a battle where Manji gets dismembered but manages to win anyway. This seems to be a narrative tactic on the part of Samura. 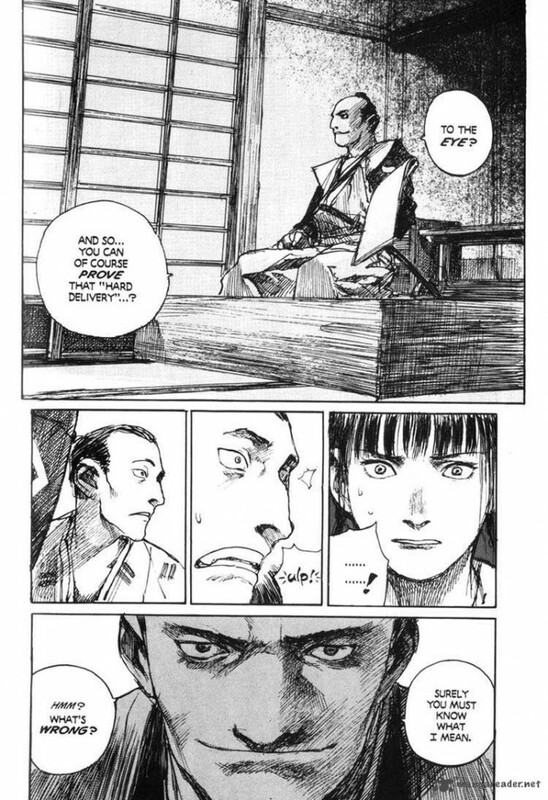 These early chapters actually spend a lot of time building up Manji and Rin’s relationship while also fleshing out the greater world of Blade of the Immortal. Eventually, starting around Chapter 5 On Silent Wings, Samura opens up the story into larger and more complex arcs. From a storytelling perspective, this is exactly where you want to be structurally. The extra space allows the core Rin and Manji relationship to evolve naturally, and it avoids the trope of a writer just telling the reader, “hey, these people know each other so there.” Instead we get to see how they interact, and crucially, how their influence changes each other. Then in addition to that we get to see all of those background characters do the same thing, so when storylines begin to overlap we are thoroughly invested in all of the characters. By this I mean all of the characters. 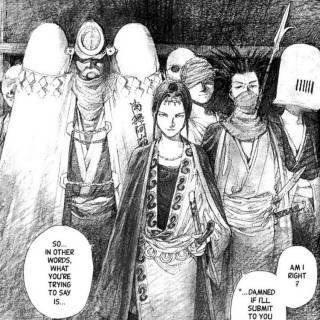 There are readers of this book who really wanted Anotsu to win at the end because they agreed with him, and that speaks to the power of Samura’s narrative technique and characterization. Note in that top panel the way that shadow and shading are used, along with the way that dark area in the upper right pulls the eye of the reader in the down and to the left direction. Plus there’s details, but there is also a hint of detail that is a by-product of the penciled style. The following panels show off some of the subtle ways that Samura is able to show fine changes in emotion from panel to panel, and control the tempo of how the panels read. The far left panel shows the character with a worried look, which gets more pronounced without getting melodramatic. Meanwhile Rin’s expression shows worry, shock and embarrassment all at once. Note how the first panel shows a lot of action and movement lines. In context this is Manji getting sliced. But the due to the detail the panel reads quickly – meaning that as a reader you’ll tend to gloss over it. The follow up is full of flowing lines and expressive detail. Even when there are horrible things going on the art still tends towards the poetic, and this panel is no exception. 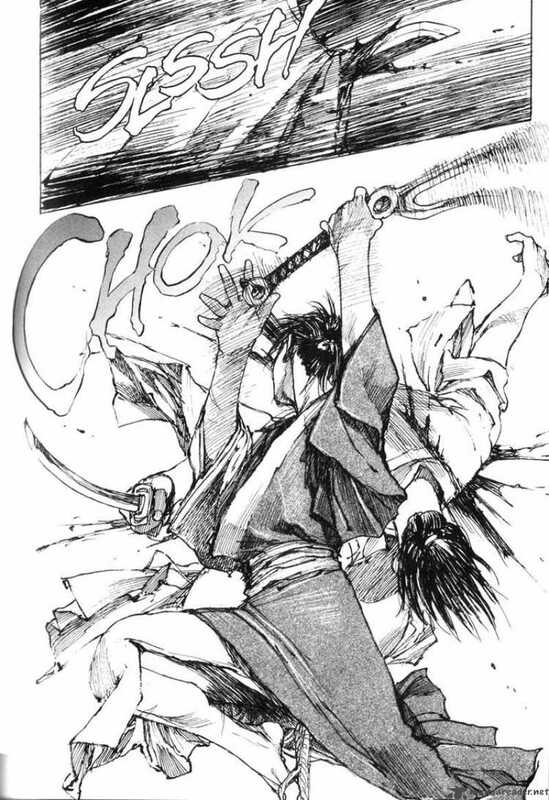 Blade of the Immortal is also, as shown in this panel, one of the most violent manga that I’ve ever read. 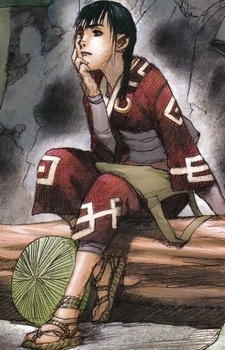 But Samura is able to render that into artful images like these that are beautiful while also being heinous. It’s an almost impossible trick, but Samura pulls it off constantly. Finding fine examples of the art was hard not because there were so few, but because there were so many. Coincidentally, watching the anime is a bit of a let down since none of the style that Samura adds came along in the translation. 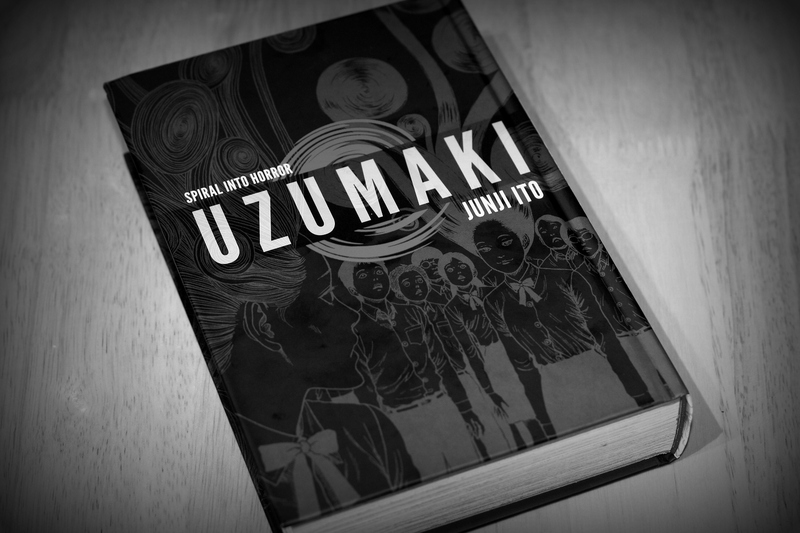 Thematically, the series uses those opening chapters to deal with monolithic topics like duty, regret and the price of immortality. Much like the building of character interactions, Samura seems to be setting the table for the rest of the story, before getting into more esoteric concepts like politics, ruthlessness and if good and evil exist. None of the themes exist by themselves, and they all build on one another to create a tapestry of meaning that makes you think about the implications of an action or a motivation. It’s rare that I get the opportunity to write about something that I really think is an awesome piece of art, and I’m grateful that I get the chance to share this series this week. When I read Manga, or watch anime Blade of The Immortal is one of the gold standards that I compare it to. It’s deep, satisfying, and strangely fun. What would you do if you could live forever? I’m not sure, but even if you aren’t actually immortal, Blade of the Immortal is something that everyone should experience.